If you’ve ever wondered how to photograph and edit day-to-night timelapses, fear not. While making day-to-night timelapses may seem overwhelmingly difficult, it’s not. The digital tools that we have today really simplify the workflow for creating them. This is not to say that creating day-to-night timelapses is totally effortless. There still is effort needed for dealing with the light changes from the beginning to the end of your timelapse images which can differ, depending on how you plan on putting your timelapse together. LRTimelapse is a powerful plugin that works along with Lightroom to create timelapses. The free version allows you to create timelapses and unlike many other trial software, you won’t get any watermarks on your videos. The free version works just like the fully licensed version, but has limitations where you can only use up to 400 images, and you can only render videos up to 1080p. It is the “holy grail” of holy grail software in my opinion, being a soup to nuts solution. At first, It may seem intimidating to use with all the different steps to go through, however the workflow is laid out in a linear way that makes it very easy to pick up after a few tries. The alternatives to LRTimelapse are limited. At the time I’m writing this article, LRTimelapse is the only purpose built software with a full timelapse workflow that I could find. If anyone knows of others, feel free to mention them in the comments below. The closest one I could find is GBTimelapse, however it has limitations. It is Windows only, Canon only, and requires the camera to be tethered to your computer with a USB cable. Using the free trial version will result in watermarked images as well. 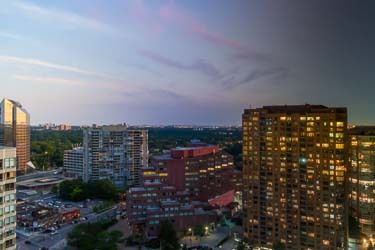 This means that alternative timelapse editing would be primarily in Lightroom and Photoshop (or other equivalent software), plus the use of deflicker software. 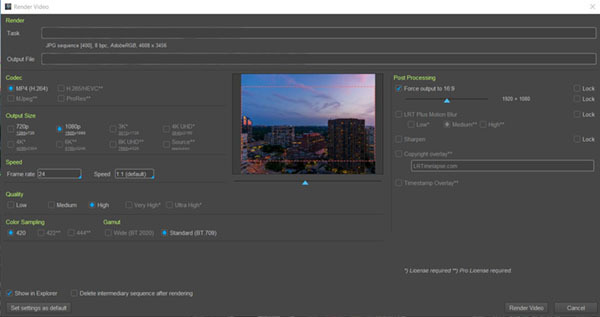 This method will be more work intensive, as you’d have to do all your processing in Lightroom and Photoshop without the advantage of automated exposure transitioning across your multiple images that LRTimelapse provides. You could try adjust your images one by one but that would take forever! One way to minimize that additional work would be to use automatic exposure settings in your camera in particular, aperture priority. While auto-ISO is another option, I wouldn't recommend it because of the noise that would be introduced to the darker images, as the ISO gets higher. As long as the exposure changes in your day-to-night images are changing steadily, then having the exposure settings automatically adjust in camera from image to image will do the bulk of the work. Big swings in exposure however, may make using the automatic settings more challenging. One thing that makes LRTimelapse great is its ability to normalize exposures in your images. This is also very useful if you have your camera set in manual, and you manually adjust your exposure settings during the timelapse as lighting conditions change. Deflicker software would be able to take care of the exposure “spikes” (flicker) that remain. As of today, the deflicker options also appear to be limited. There is GBDeflicker which comes in either a standalone Windows application or an Adobe plug in for use in After Effects or Premiere Pro. Both of these versions offer free trials but like the GBTimelapse application, your images will be watermarked. MSU Deflicker is another plug in which is used in the free, open source video processing utility called VirtualDub. It is a totally free option however, it is a Windows only solution. If you’re a Mac user, then the only option of these that would work would be GBDeflicker's Adobe plug in, with a cost of $59 to avoid watermarked images. The tutorials on the LRTimelapse website are fantastic. I will summarize the workflow steps to help give a sense on how in depth this plugin is. To get more detailed editing steps and video tutorials, you can find them on the LRTimelapse website. You will be working with both Lightroom and LRTimelapse at the same time, so you’ll need both applications open. Save these adjustments as metadata to XMP files associated to your RAW files. You could start in LRTimelapse and then import them with the metadata adjustments to Lightroom at the last step, however my preference is to do my import before starting work in LRTimelapse. It's just part of my natural workflow to import to Lightroom first. Go to Lightroom and in the Library module, read the metadata from the XMP files in order to update your images with the LRTimelapse adjustments. Then, filter the images to show only the keyframes and do your post processing to the keyframes as you would any RAW file. Start with the first keyframe image, then sync your edits to the next keyframe before making any additional adjustments to it, and so on until all keyframes are edited. After editing, select all the keyframes and save the metadata back to the XMP files. Visual Deflicker to smooth out any remaining exposure spikes between images. Go back to Lightroom, select all your images and read the metadata from the XMP files again, which will update all your images with the second round of adjustments. Then, start the export process. 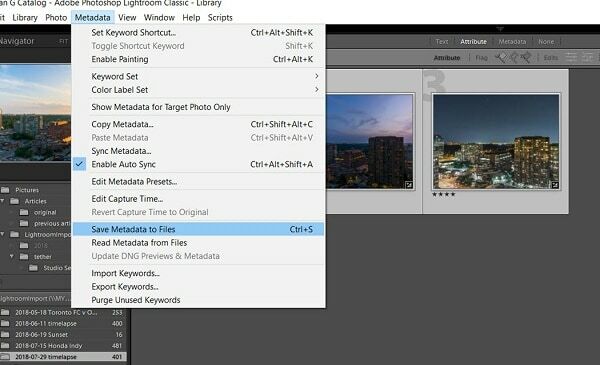 Lightroom will create a series of sequential JPG files. It will also trigger LRTimelapse to prompt you to choose video settings and to adjust the crop of the video if needed, before the video rendering process starts to create the video file. As an alternative to using LRTimelapse, doing your image edits in Lightroom to start would be easier, so that you can do your edits to a single image (as you would any other photo), and then sync those edits to all the other images you have for your timelapse. Make sure that you crop your images by selecting the appropriate aspect ratio that you'd need for your video (for example 16:9 for a 1080p video). Photoshop could be used for image edits too but to apply the same edits to multiple images, you’d need to create an action that captures the edits you want to make, and then apply that action to a batch. All images to edit would have to be in a single folder for the action to work, as you’d point to that folder when running the batch. Once your images are edited and ready for export, export them as JPGs into a single folder ensuring that the filename for each image is sequentially named. Also, make sure that the image sizes in the export options are set to what you want for your video. For example, if you want a simple HD video, make sure the images are sized to 1920×1080 which aligns to the 16:9 aspect ratio that you would have chosen when cropping. Go to File > Open, navigate to the folder with your JPGs and select the first photo of the JPG sequence. Select ‘Image sequence’ and click Open. Choose the frame rate (24fps, for example) that you want your video to be and click OK. Adjust the crop/scale of your layer if needed. You can also add any additional editing you want on top of the layer. 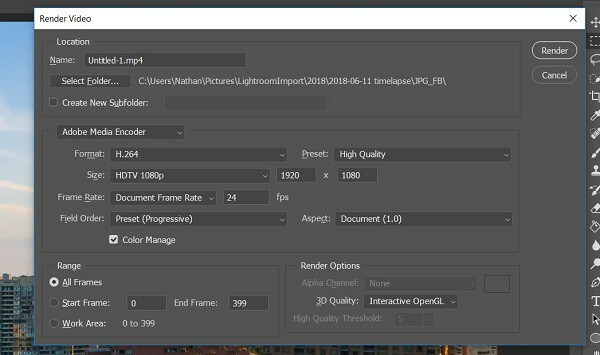 Go to File > Export > Render video to create your video file, updating your render video options as necessary (selecting the HDTV 1080p size, for example). Click Render to begin creating the video. 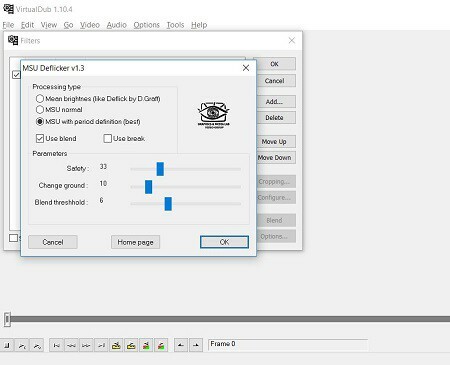 Once your video file is completed, run your deflicker software of choice on it to remove any exposure spikes that remain. So there you have it. Regardless of which processing option you decide to go with, the options you have for editing day-to-night timelapses are much simpler than they have been in years past. Hopefully this will help guide you with an editing option that is best for you, and that you are able to put together some fantastic timelapses. Nathan is a hobbyist photographer from Toronto Canada, working by day in the financial services industry. While he likes trying many different types of photography, he really enjoys photographing landscapes, travel and sports. Feel free to visit www.nathangphotos.com and Instagram: @nathangphotos to see his photos.